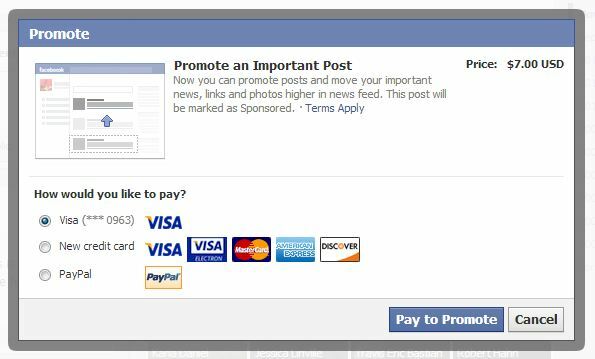 Ten days ago the guys in charge over at Facebook announced that users can now promote posts for a one-time fee of $7. It comes a little more than a year after the guys at FB responded to a viral hoax, alleging that Facebook would start charging users to use the social site’s new platform. Guess they changed their minds. When you update your status you now have the option to promote your post. By doing so, your post will appear at the top of your friend’s feeds, helping it to gain more visibility. But be warned. As soon as you click that 7-letter word your credit card info is called for. Some time ago Facebook changed the way the Newsfeed scrolls by giving users the option to view Newsfeed posts one of two ways ~ “Top Stories” or “Most Recent”. Being the FB junkie that I am, I prefer to read my posts in chronological order. But FB nearly always defaults to “Most Recent”, so after I log in I have to click the “Sort” button and change my settings. That’s common sense for me. But again, a lot of my friends don’t get online as often as I do, therefore they don’t catch every post that has been listed. On that note, a promoted post will gain more visibility as it will have the opportunity to loiter at the top of a friend’s feed – hopefully long enough that those who only log on once or twice a week will have a chance to see the big news. It will also be beneficial for those who have a lot of Facebook friends. I happen to keep my Facebook circle tight, only some 200-300 friends are connected. But there are those who chose to become friends with anyone and everyone they’ve ever met. So, for all the high school kids who have some 700-800 Facebook friends, they too will now have the opportunity to see the big news when Johnny pays $7 to promote the news that he’s now ‘in a relationship’. This is why Facebook drives me nuts. Not all of my friend’s status updates show up in my newsfeed. FB filters posts and only publishes the ones that are most relevant to me. Maybe my friend Jared’s posts don’t show because we don’t often interact. My friend Julie’s posts might not show because I have her flagged as an acquaintance. So right off the bat, even though I scan my Newsfeed several times a day, there are still posts I miss. Facebook clearly recognizes the problem, and now they are choosing to ‘help’ users by charging a fee. So much for being free, right? Let me share a personal example that demonstrates how a post could have benefited from being promoted. Earlier this year I found out I was going to have a baby. I think that’s worth announcing on Facebook. In fact, in my opinion, not many other things trump an addition to the family. It was Valentine’s Day, so I chose to share a family photo from a recent vacation to Las Vegas. Under the photo I wrote that we were taking ‘bets’ to find out whether baby #2 would be a girl or a boy. Sondra: I can’t remember if I liked or not, but I did see your big announcement (Congrats!) but I am also 36 weeks pregnant sick with the flu and every time I get a second to sit the computer my kids distract me and I forget what I am doing. Just don’t get rid of us totally overwhelmed people…. Krachel Greenwood Not hormonal – just keepin it real. Cami: Congrats! Missed it yesterday but I say another girl. Christie: Its true there’s a lot of non commenting lurkers out there… I don’t like the ones to just read the gossip but never post anything of their own! Cindy: I saw all the comments and you have a lot of fb friends that commented. You mean you have even more than those who didn’t comment. Excited about the announcement. I’m thinking another girl! Jill: I missed it yesterday too. Congrats! I don’t get on Facebook everyday. Sometimes only about once a week. Probably alot of the non commenters out there just don’t get on all the time, so maybe they missed the big announcement? I would have if I didn’t get on tonight. Anyway, congrats! I’m so excited for you. I say boy to help Matt out a little. Have to balance the hormones out you know! Kandis: Don’t delete me!! And I think you’ll have a boy. Krachel Greenwood I know there’s a lot who don’t get on daily. But there’s also a lot who do… Yet try to stay anonymous. Chances are if we’ve chatted in the past – you’re probably safe. Terri: Great, I am safe. I can sleep better tonight. Dana: I missed it… Sorry! that’s awesome! I always miss the good stuff. many congrats! Wendi: I get it everyday…oh, but you are talking about fb. I am going to say boy. They are the ones that makes us feel bad and unloved. Angela: What if I was too busy gettin busy to see your announcement yesterday? Frank: PHEW! so glad i commented yesterday!! Robert: As someone who used to work in the news business, I hope you’ll understand and forgive me for having a rather hectic couple of days at my station, and failed to comment on your photo. Now, that being said…Congratulations! Are you guys hoping for a boy or a girl? One of each? Mindy: Uh oh. I just commented. Hope I make the cut. If I could triple like your announcement, I would. Such exciting news! Hugh: As a father of eight, two of them boys, I must guess it will be a girl. Mood swings considered? Kristin: You opened a can of worms here lol I didn’t comment either but am so thrilled for you. I’m guessing a girl so your older one can have can have a little sister. I say you can never have to many friends to love and support you. You never know when you may need them. Aaron: Missed the announcement. Congrats are in order. John: Your updates don’t always appear on my feed. That said, Jaqueline and I DID congratulate you in our own conversations, just not on your page. Love to hear you guys are making another baby. Or MADE another baby as this case may be. Atta girl. Or boy. Timothy: Congrats Krachel. I guess Matt helped a little…well maybe not a little. Mom told me last Saturday you were expecting in July. Sounds like a road trip out west is in the future. Nika: I liked it. I’m happy for you, please don’t break up with me. PS how are you feeling? Tricia: Congratulations to you and your family! I don’t always see or comment on every post but love to check in and see how everyone is doing. I’ll say twins – a boy and a girl! Melissa: i didn’t even see the announcement!!!! congrats! how far along are you? Krachel Greenwood Hey – to be fair – we all clean house here and there – I just chose to give a heads up! Heather: I agree with jill. Some of us may have missed it because our feeds turn over quickly or we don’t check fb every day. Congrats btw! Katie: And everyone who loves you and checks Facebook regularly deserves to stay. Please keep me, as I commented from Germany! Rebekah: It’s good to clean house every once in awhile! Michael: I’m coming in late to the conversation….Keep me!!! And congratulations!!! Jami: Sheesh, glad I got on FB yesterday!!! Sandy: Hey, congratulations. So exciting. I guess this means you wont be able to catch for softball. im sad about that, but so excited your 3-yr-old will be a big sis. good luck ! Shauna: Oh my…..i guess I’m TOTALLY OUT!! congrats krachel and matt!! How fun to be having another baby! Oh how I hope he wears the kilt to bless new baby greenwood!!! I’m so excited for you guys!! The truth is – I had to take a step back and realize that not everyone gets on Facebook as much as I do. Then again, most people don’t get PAID to be on Facebook (like I do). So to sum it up, sadly, I believe that promoted posts are a good idea. Who knows? You might just see me pay to announce baby #3.